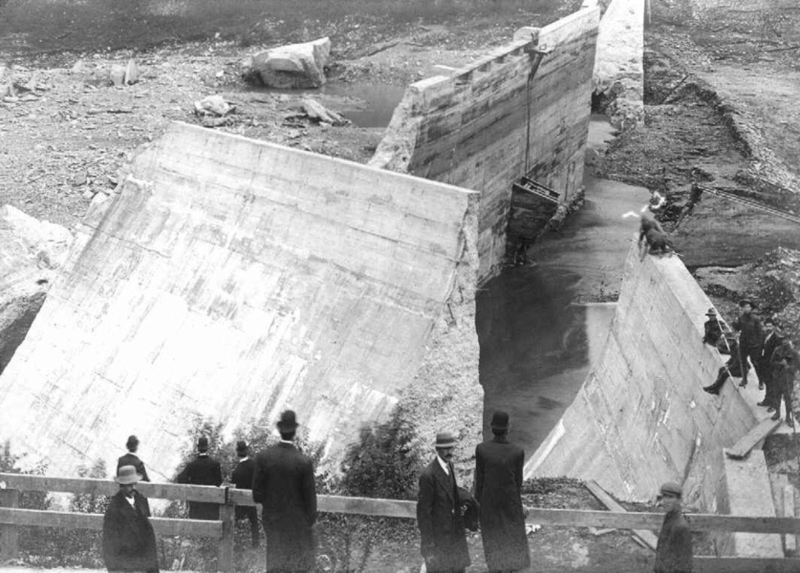 Remnants of Austin (Bayless) Dam one day after failure. The dam's failure due to sliding can be directly attributable to the designer admittedly neglecting to account for uplift pressure due to a misguided approach in crediting certain design features with the ability to completely eliminate this force. When a concrete dam impounds a body of water, it will experience a load or force commonly referred to as hydrostatic pressure. A variety of other forces such as uplift pressure, earth pressure, silt pressure, wave pressure, wind pressure, ice pressure, seismic acceleration, hydrodynamic pressure, and thermal stress from ambient temperature changes can also act on the dam depending upon site conditions. 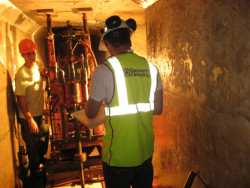 Though it is imperative to analyze all applicable force combinations specific to a given site when evaluating an existing gravity dam or designing a new one, history has proven that the consideration of uplift pressure is especially important. Uplift is an active force that exists within both the foundation and the concrete structure itself. This pressure is present in cracks, pores, and joints of the concrete within a dam, at the interface between the dam and the foundation, and in cracks, pores, and seams within the foundation rock. 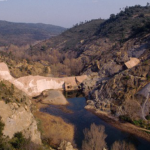 Large uplift pressures can compromise the structural adequacy of concrete gravity dams and serve as the principal cause of failure. 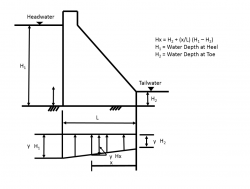 Because uplift pressures can greatly impact the stability of concrete gravity dams, they must be analyzed and accounted for during design and evaluation of such structures. 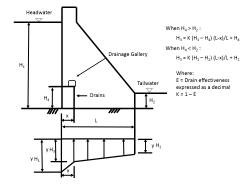 Direct reduction of uplift pressures can be accomplished by the incorporation of a drain curtain, also known as drainage or relief wells. These internal drainage systems consist of a series of vertical or vertically-inclined wells or boreholes that facilitate the draining of the foundation and abutments in order to relieve the uplift pressure caused by impounded water. 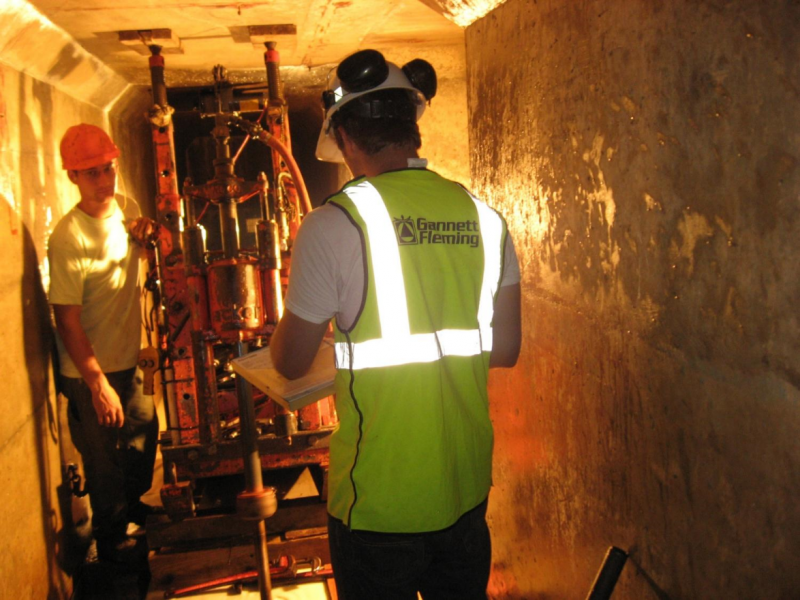 Effectiveness in reducing uplift pressures through drainage systems is dependent upon drain hole size, depth, spacing, and maintenance as well as the character of the foundation. In addition, a grout curtain positioned upstream of a drain curtain within the dam’s base can also facilitate the reduction of uplift pressures by eliminating or decreasing the number of seepage paths. 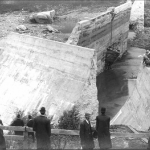 Prior to the 1920s, many gravity dams in the United States were designed without any allowance for uplift. 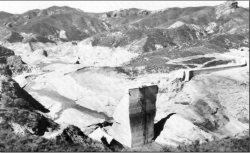 The general view was that uplift could not develop at the base of a gravity dam to any significant degree since the dam by its own weight placed the structure in positive contact with its foundation. 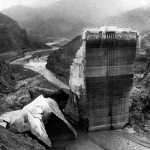 After some highly publicized dam failures in the early 1900s, engineers began to pay more attention to accounting for this force. At that time, the practice consisted of two components. The first component related to “uplift intensity” which assumed that uplift varied linearly from full reservoir pressure at the upstream face to zero or tailwater pressure at the downstream face. The second component related to the proportion of the horizontal area of the structure’s base or partial section above the base in which uplift acted upon. 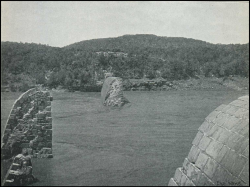 Depending upon foundation rock characteristics and whether or not grout and drain curtains were to be included, uplift intensity was applied to one-third, one-half, two-thirds, or the full horizontal base area. It wasn’t until the 1950s that engineers began to adopt the more conservative approach of applying uplift to the full base area regardless of whether or not grout and drain curtains were to be included. Since uplift can be a significant destabilizing force, any design or evaluation should properly account for it. 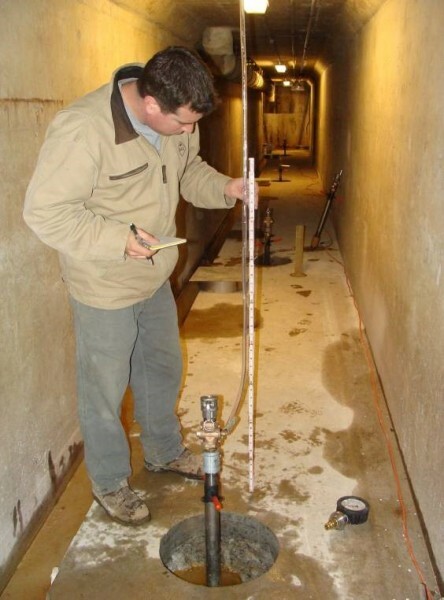 In certain cases, it may be appropriate to install instrumentation to measure and confirm the validity of uplift assumptions. 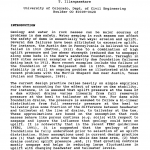 (1) Amadei, B., Dialer, C., Chinnaswamy, C., & Illangasekare, T. (1991). 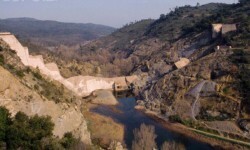 Effect of Geology on Uplift and Dam Stability. ASDSO Annual Conference. San Diego: Association of State Dam Safety Officials. (2) FERC. (2002). Gravity Dams. 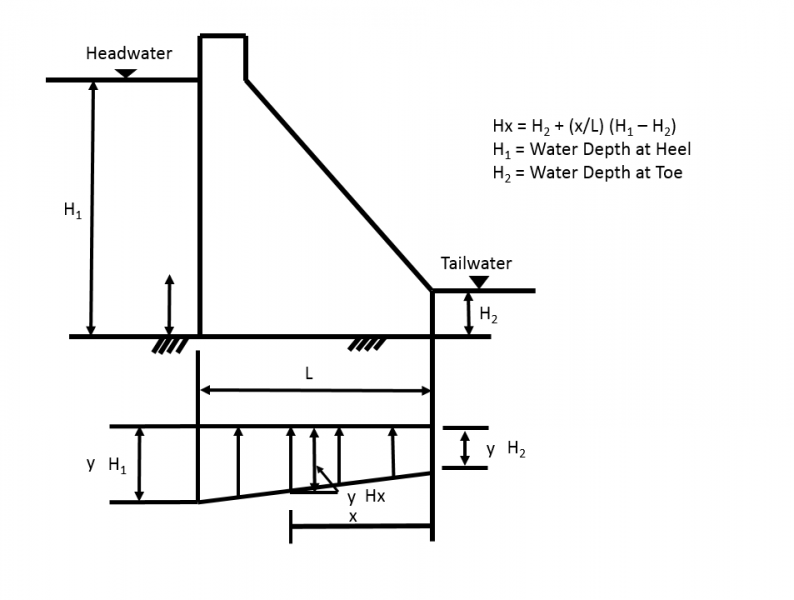 Engineering Guidelines for the Evaluation of Hydropower Projects. Federal Energy Regulatory Commission. (3) USACE. (1995). Gravity Dam Design, EM 1110-2-2200. Washington D.C.: U.S. Army Corps of Engineers. (4) EPRI. (1992). Uplift Pressues, Shear Strengths, and Tensile Strengths for Stability Analysis of Concrete Gravity Dams, Volume I, EPRI TR-100345. Electric Power Research Institute. (5) Houk, I.E. (1930). Uplift Pressure in Gravity Dams. Western Construction News, 344-349. 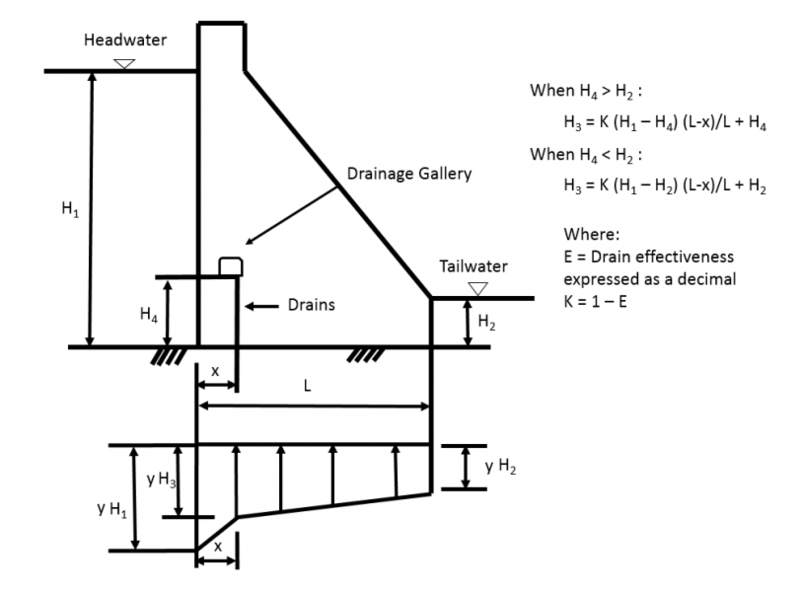 Uplift pressure calculation for dams without drainage systems. 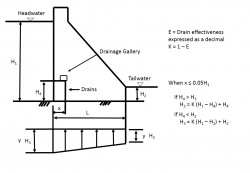 Uplift pressure calculation for dams with drainage systems. 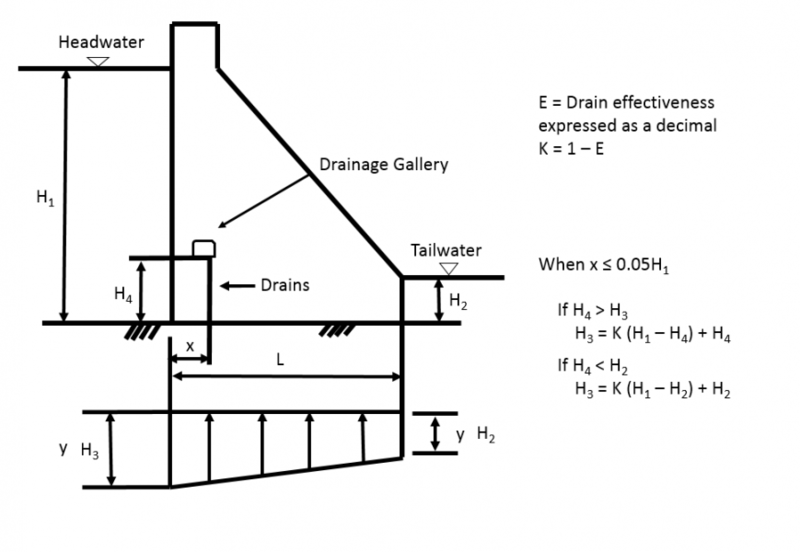 Uplift pressure calculation for dams with drainage system near upstream face. Drilling foundation drains within gallery of concrete gravity dam to relieve uplift pressures under the dam. Monitoring of uplift pressures at foundation drains within the gallery of a concrete gravity dam. Remnants of the Malpasset concrete arch dam in Frejus, France whose failure in 1959 can be partially attributed to the design’s inability to accommodate uplift pressures (Photo source: Richard E. Goodman, 2013 AEG Shlemon Specialty Conference). Failure of Austin Dam, Austin Texas, in 1900 was partially attributed to the design neglecting uplift foundation pressures. Failure of St. Francis Dam, Los Angeles, California in 1928 was partially attributed to the design neglecting uplift foundation pressures. Failure of Bayless Dam, Austin, Pennsylvania in 1911 was partially attributed to the design neglecting uplift foundation pressures. Robert A. Kline presents an introduction to concrete gravity dams as part of the Association of State Dam Safety Officials On-Demand Webinar series. Guy S. Lund and Robert A. Kline present methods for evaluating the stability of concrete dams as part of the Association of State Dam Safety Officials On-Demand Webinar series. Robert A. Kline presents an overview of successful methods for improving the structural stability of existing concrete gravity dams as part of the Association of State Dam Safety Officials On-Demand Webinar series. Part 1 of an instructional video by Dr. Don U. Deere on dam foundations as part of the Federal Emergency Management Agency’s Expert Video Series on dam safety. Part 2 of an instructional video by Dr. Don U. Deere on dam foundations as part of the Federal Emergency Management Agency’s Expert Video Series on dam safety. 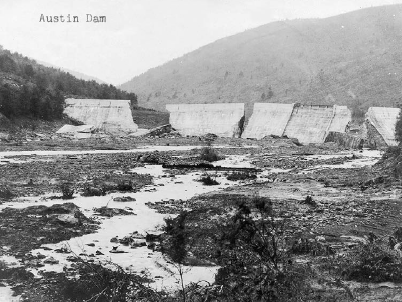 Austin Dam (also known as Bayless Dam) was constructed between May and November of 1909 just outside Austin, Pennsylvania, a town of approximately 2,500 people in Potter County. I.E. Houk. (1930). Uplift Pressure in Gravity Dams. Western Construction News, 344-349. EPRI. (1992). Uplift Pressues, Shear Strengths, and Tensile Strengths for Stability Analysis of Concrete Gravity Dams, Volume I, EPRI TR-100345. Electric Power Research Institute.